Once Upon A Time, Stephen Sondheim and James Lapine wrote INTO THE WOODS, a magical musical comedy based on the fractured fairy tales of The Brothers Grimm. Sondheim and Lapines story asks the question: what would happen if all of our favorite storybook characters (and a couple of their own invention) ended up meeting one another in those magical woods? Sondheim and Lapine created a dark and funny story about a Witch's curse that condemns a Baker and his Wife to a life without children. The husband and wife so deeply want to have a child that they close up shop to embark on a quest through an enchanted forest to find the four items required by The Witch to break the spell: the cow as white as milk, the cape as red as blood, the hair as yellow as corn, the slipper as pure as gold. There in the woods, the Baker and his wife happen upon the familiar storybook characters we all grew up reading and watching and pretending to be: Cinderella, on her way to the festival to dance with a prince; Rapunzel, held captive in a doorless tower by a wicked witch; Little Red Riding Hood, on her way to her Grandmothers house; The Wolf, who wants to eat Little Red Riding Hood for lunch; Jack and his magical beanstalk; and The Giant, who chases Jack down the beanstalk and back into the arms of his overly protective mother. We also encounter not one but two handsome princes, one mysterious man, a wicked Stepmother, two wicked stepsisters, Cinderellas indifferent father, the ghost of Cinderellas Mother, and many other magical and familiar characters you are sure to recognize. There's even an objective Narrator to help us keep all of these twisted stories straight. Will the Baker and his wife succeed in breaking the witch's curse? Will Cinderella marry her Prince? Will Rapunzel let down her hair? Will Little Red Riding Hood get to Granny's house in time to save her from the Wolfs belly? Will Jack slay the giant? And what happens after they all get their wish - even the Witch - and live happily ever after? Find out when Playful People Productions presents the full-length production of Stephen Sondheim and James Lapines INTO THE WOODS. Two casts (Adult and Teen) are under the direction of New York-based theatre artists Gary De Mattei and Caryn Hartglass, the same team that brought our audiences FIDDLER ON THE ROOF and last seasons THE MUSIC MAN. You wont want to miss this, the final show of our summer season. 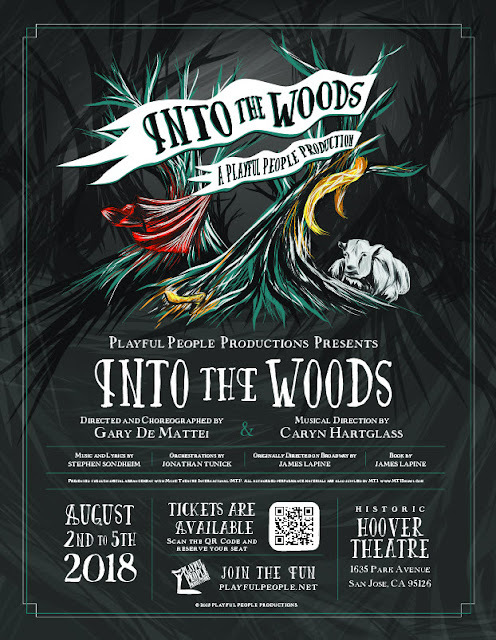 With a small ensemble of professional musicians playing live onstage, and lovely costumes and scenery, INTO THE WOODS is sure to be a crowd-pleaser for audiences ages 9 years old and above.